I am writing to bring to your attention the attached correspondence from GreenLaw concerning the proposed Sahal Trail interstate pipeline system. The pipeline study corridor under reviewextends from Alabama into Florida and passes through the Second Congressional District of Georgia, which I have represented in the United States Congress since 1993. As you are aware, the scoping period for submitting comments relating to the Federal Energy Regulatory Commission’s (FERC) environmental review is scheduled to expire on April 20, 2014. GreenLaw is requesting that the scoping comment period be extended for at least thirty days to allow them to provide meaningful scoping comments, particularly with respect to alternative pipeline routes that will reduce the disturbance and taking of lands. I also have heard from constituents as well as local elected officials who are requesting that the comment period be extended. 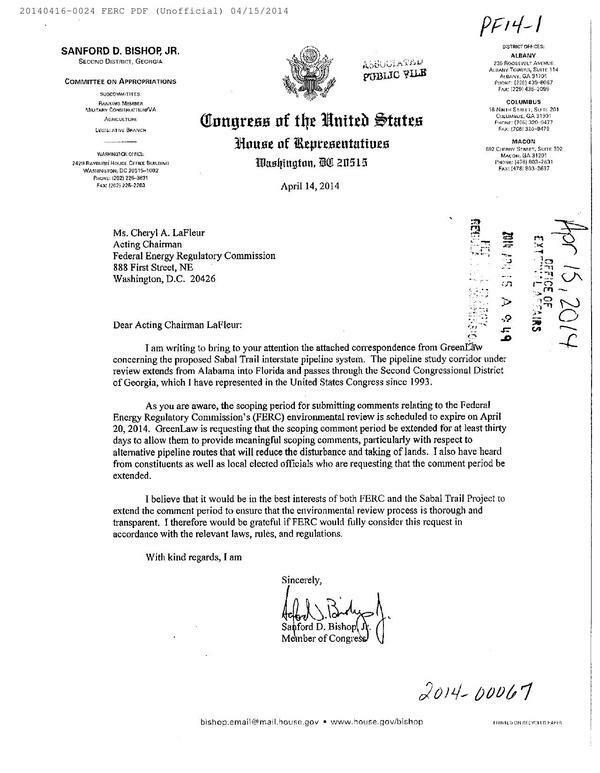 I believe that it would be in the best interests of both FERC and the Sabal Trail Project to extend the comment period to ensure that the environmental review process is thorough and transparent. 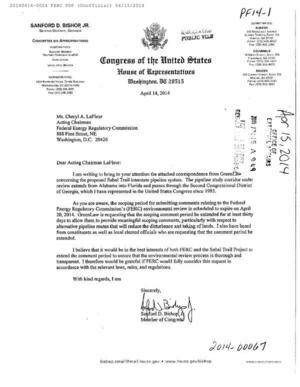 I therefore would be grateful if FERC would fully consider this request in accordance with the relevant laws, rules, and regulations. The rest of this filing is a copy of the Greenlaw filing of 7 April 2014. Here’s PDF of the Congressman’s letter, and of his whole filing, including the Greenlaw letter.